Spend a day with nature. Go to the Sunset Beach & board a native motor boat to cruise the lagoon and lunch at the beach. Surrounded by palms, water hyacinths and native flora, this has been the location for Hollywood films such as The African Queen and Rambo. This tour is a must for nature lovers. Once at the beachfront you can enjoy a typical lunch and domestic drinks. After lunch, you can walk along the beach or just relax in a hammock. Once you are picked up from your hotel or cruise enjoy a drive through the housing areas of the middle and the working class of Acapulco, your guide will be elaborating about the lifestyle and all there is to know about the Mexican Society, after admire the Acapulco City Market and see the place where locals get Fruit, Vegetables, Chicken and Beef as your own guide will explain to you all there is to know about this fabulous country the after you will enjoy a cliff-side ride along the beautiful coast to the Coyuca Lagoon, one of the most picturesque and colorful places in Acapulco. This tour is a great combination of a fresh water lagoon and incredible sights. Get your camera ready for some fun tropical snaps of you and the beautiful natural flora that characterizes this awesome Acapulco attraction. 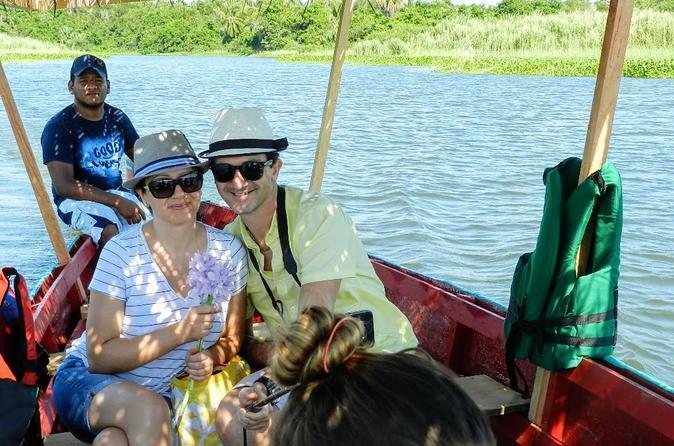 When your air conditioned van arrives at the heart of the lagoon you will transfer to a small typical boat to cruise through the thick vegetation. A paradise for flora and fauna, this tour is a must for nature lovers. Explore the area on board an exciting boat and discover the green dense vegetation surrounding it. Enjoy a cruise along the Coyuca Lagoon, one of the most picturesque and colorful parts of Acapulco. This area is famous for its tropical vegetation and has been the location for many Hollywood movies including Sylvester Stallone's Rambo II and The African Queen. Enjoy lunch and drinks in one of the world's most relaxing settings. You will visit a local beachfront restaurant where you will enjoy typical lunch and domestic drinks. After lunch you can walk along the beach or just relax in a hammock. After lunch take a walk on the beach or enjoy the ocean breeze as you sit back and relax.